Unleash the power in your computer. With a solid state hard drive your file access is three to ten times faster. Would you like your computer to boot up in seven to ten seconds? $125.00 can make your computer perform faster and stronger. The old mechanical hard drive in your computer throttles the power in your computer. Lets look at an entry level HP laptop. On the left is a hard disk transfer speed test. On the right is the same machine with a solid state drive test results. This shows your data moves three times to eighty times faster inside your computer with a solid state hard drive installed. Why not let your computer run fast? Your data and programs are copied to your new SSD. Nothing to lose and lots of speed to gain. Notice the processor test speed improved slightly, by 8%, with the solid state drive. The drive speed is almost four times faster. You get more power out of your computer. Browse the web, create documents and create spreadsheets faster than you ever have before. What was the computer being tested? A HP 14-an080nr was used for these tests results. This machine was first released in May 2016. This is an entry level notebook, but the performance gain is significant. 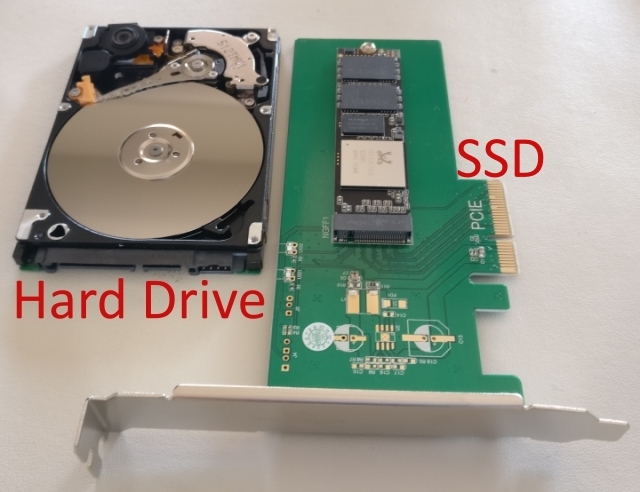 If you buy a laptop or notebook the hard drive can be replaced with a solid state hard drive. The $125 price is for a 120 G byte SSD, installation and transfer of all of your data. There are four speeds of drive controllers in computer today. Sata, Sata II and Sata III. 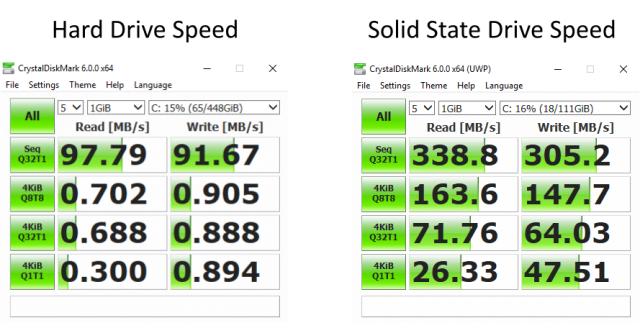 The extra power suppled by the upgrade to a SSD produced great results. You don’t have to plod through computer tasks because you have old technology inside your computer. If you have a desktop machine the PCI bus type can also limit the top speed of your data movement. Check this reference chart below. With an older desktop machine your top speed will be limited to the type of PCIe slot that came with your motherboard. This is the decision point to decide when to upgrade to a new machine. A SSD can allow your machine to run at full speed. Today’s new computers have faster components to allow information for virtual reality systems and gaming machines to run at peak performance. If you want more speed from your current machine or a complete replacement we can help. Fill the form below and we will contact you to speed up your machine.